पीटीईटी प्रवेश पत्र 2019 जारी कर दिए गए , आप नीचे से डाउनलोड कर सकते हैं . The Pre Teacher Education Test (P.T.E.T) 2019: Passing the Bachelor / Postgraduate Examination of any University established by law, which is considered equivalent to the graduate / postgraduate examination of the State University of Rajasthan and on the PTET web site. Candidates who meet the eligibility requirements mentioned in the available Directions Directory are eligible for application. Minimum 45 percent marks for the general category, minimum 45 percent marks for the scheduled caste / tribe / other backward classes / special backward classes / divyanga and widow / divorced women candidates are mandatory in accordance with the rules of the state government in the graduate / post-graduate exam. Pre B. A . B. Ed. / B SC B. Ed. 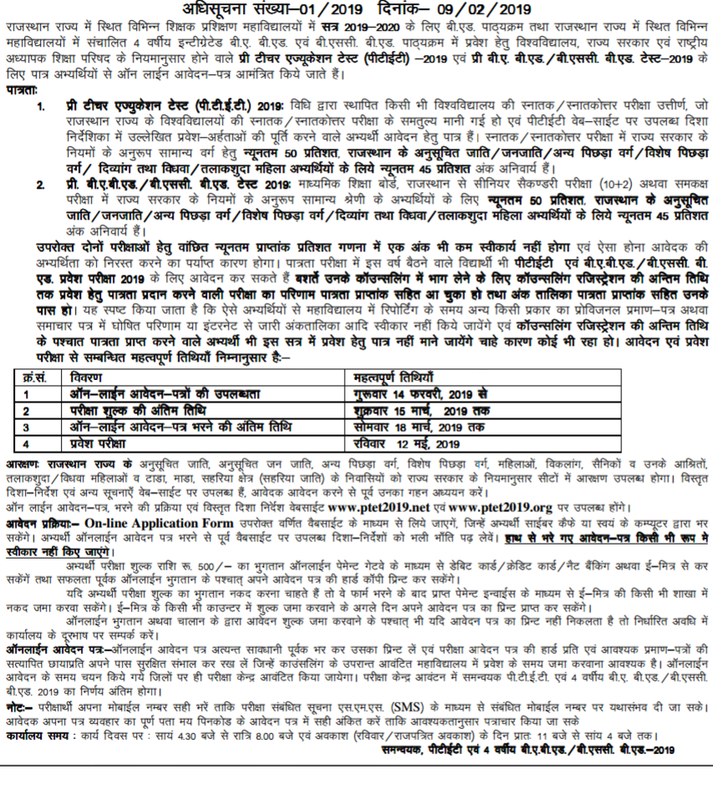 Test 2019: Secondary education board, Senior Secondary examination from Rajasthan (10 + 2) or equivalent examination in accordance with the rules of the State Government, minimum 50 percent for candidates of general category, SC / ST / OBC / special backward Minimum 45 percent marks are mandatory for class / divyang and widow / divorced women candidates. For the above two exams, the minimum score in the percentage score will not be less acceptable and it will be reason enough to abate the applicant's candidature. Students appearing in the eligibility examination this year also have PTET and B. a . B. Ed. / BSc, B. Ed. The entrance examination can apply for 2019, in order to participate in his counseling, the result of the qualifying examination for admission till the last date of the counseling registration has to be completed with the eligibility marks and the marks table will be along with the eligibility marks. It is clarified that such candidates will not be accepted in any other provisional certificate or newspaper results published in the newspapers during the reporting period or the issue points issued from the Internet etc. and those who have qualified after the closing date of the council registration Candidates will also not be considered eligible for admission in this session, regardless of who they are. Important dates related to the application and admission test are as follows: | | Details Important Dates Online Application . The availability of letters The last date for filing on-line application form from Friday, February 14, 2019 till 15 March 2019. Monday 18 March 2019. On-line application - Last date for filling up the letter Monday 18 March 2019. Admission test Sunday, May 12, 2018 Reservation: Scheduled Castes, Scheduled Castes, Other Backward Classes, Special Backward Classes, Women, Disabled, Soldiers and their dependents, divorced / widowed women and Tada, Madi, Saharia area (Saharia caste) Reservation will be available to the residents of the state according to the rules of the state government. Detailed directions and other information are available on the web site, the applicant should make an intensive study before applying. On-line application - Letter, filling process and detailed guidelines website www. ptet2019 net and www. ptet2019 will be available at org. Application Process: - 0n - line Application Form will be taken through the above mentioned website, which will be filled by candidate cyber cafes or by their own computer. Candidates should read the guidelines available on the website properly before filling the online application form. Hand-filled applications - letters will not be accepted in any form. Candidate Examination Fee Amount Rs. 500 / - per day through online payment gateway, debit card / credit card / net banking or e-friend will be able to successfully print hard copies of their application after online payment. If the candidates want to pay the examination fee, then they will be able to deposit cash in any branch of e-friend through payment payment received after filling the form. E-Friend will be able to get a copy of their application on the next day after depositing the fees in any counters. | Even after the application fee or challan is deposited by the application fee, if the print of the application does not come out, then contact the office on the telephone in the prescribed period. Online application form - Please fill the online application form carefully and take the copy of the hard copy of the examination application and the verified photocopy of the required certificates and keep it safe, which is required to be submitted at the time of admission in college allotted after counseling. is . The examination center will be allocated on the selected districts only during the online application. Coordinator in examination center allocation p. T. E. T. And 4-year-old B. a . B. Ed. / B SC B. Ed. The decision of 2019 will be final. Note: - The candidate should fill his mobile number correctly so that the examination related information is available. MMs . (SMS) to the extent possible on the respective mobile number. The applicant should complete his letter in the full address in the application form in the Pincode application so that correspondence can be made as necessary. Office Hours: On weekdays: 4pm 30 pm to 8 pm 00 o'clock and on holiday (Sunday / gazetted holiday) from 11 a.m. to 4 p.m. Coordinator, Ptet and 4 year old B.A B. Ed. / B SC B. Ed - 2019. 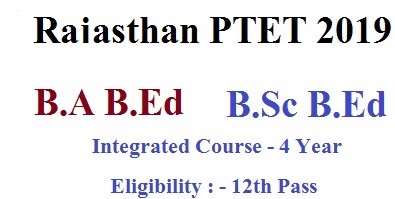 BTech students are eligible or not for B.Ed? How to make corrections in ptet application form? Is b. Com. Pass students are elegebal for two year B. Ed course. Please guide us. Please tell me now . bhai mere m bhi same problem h mera surname glt h.